When I find an item that's cute and functional and washable... you can bet I'll be sharing how much I love it, maybe even more than once. That's how we are with Lorena Canals Rugs! Right after we tried one of their rugs for the first time 3 years ago, we were hooked. I just love how they bring a space to life, but most of all how they're washable! With little ones, spills and crumbs are truly inevitable, so the fact that if something gets spilled, ground into or tracked onto this rug, all I have to do is pick it up, throw it in the wash just like I would any regular load of laundry and then dry as I normally would a load of laundry fresh out of the wash. It's just the best, and not only does it make my life easier as a parent, but it also allows my kiddo to just be a kiddo. Another thing we love as a health conscious family, is that these rugs are about as natural as it comes when it comes to area rugs. Each rug is , eco friendly and hand made and only dyed using natural dyes. They also contain no VOCs like most carpeting and rugs. Lorena Canals are loved by regular mamas just like you and me, but also raved about by all of the celebrity moms as well! Lorena Canals was chosen by Vogue recently as a top product for nurseries, and I can completely understand why! It's one of my favorite items in my babies shared space just because it's so functional, but especially because can be cleaned so fast and easy (no need to hire steam cleaners or buy/rent a carpet shampooer). After each wash and dry, it gets so fluffy and super soft, it honestly feels, and looks brand new with every wash! 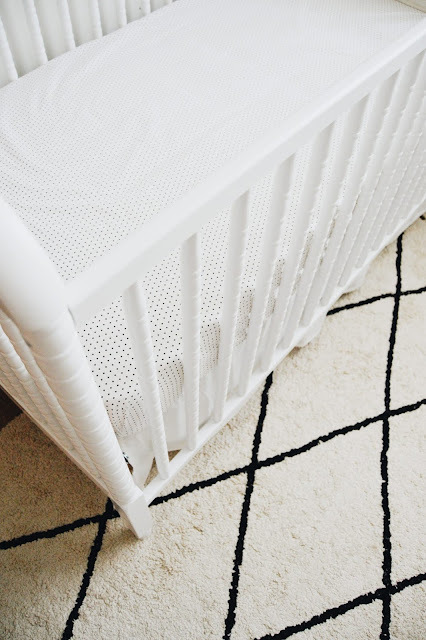 When new moms ask me what my top favorite and must have nursery items are, these rugs from Lorena Canals are always at the top of my list of recommendations. 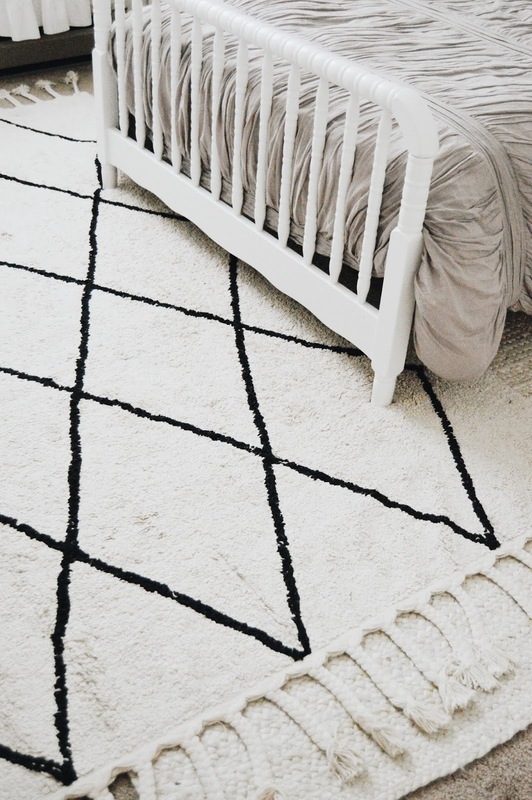 In the past we've owned an adorable purple flower rug (not currently available), and this sweet gray and white dot scallop rug and loved them both, but this beige and black stripe bereber tassel rug has to be my most favorite of them all. It brings such a look of sophisticated-ness to the room, and lightens the room up since its a nice light neutral color. It surprisingly doesn't show dirt or crumbs hardly at all since it's a nice cream color. While we've just used Lorena Canals rugs in our little one's space, the great thing about Lorena Canals rugs, is that they make perfect rugs for any room! 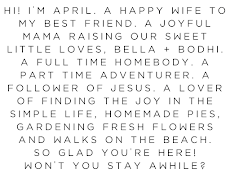 Kitchens, family spaces, even big bathrooms or entryways! 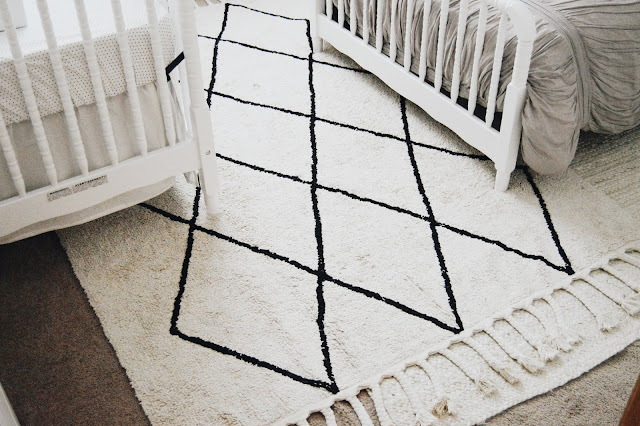 How cute is this rug in Bella and Baby #2's shared space? !